I’ve been quilting this summer, I swear. I just haven’t been blogging about it. I’ve done those wristlets in the previous post and I’ve done (and sold) more of those cute shopping bags. Actually, those are being sold as fast as I can produce them. And if you want one please let me know and I’ll make one for you. They are currently being sold at $45 each, which basically just covers the cost of making them. 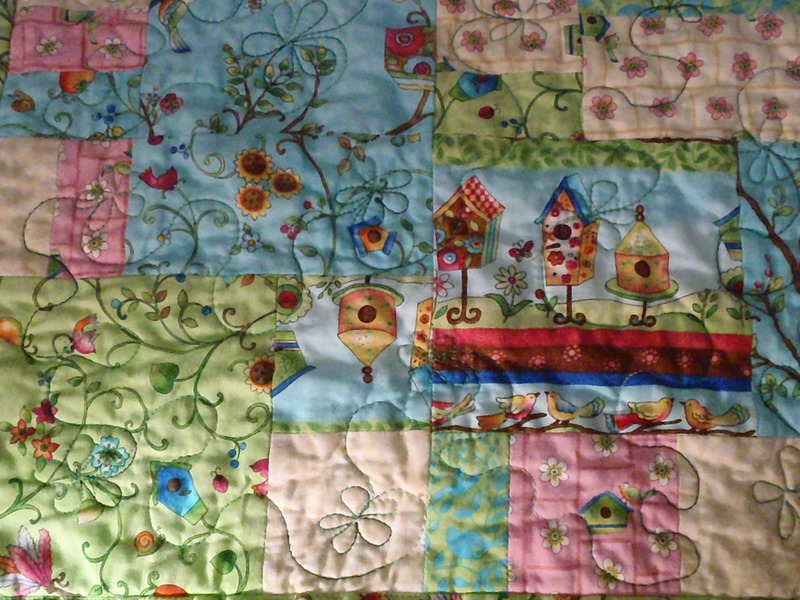 In the meantime I’ve gotten another commission for a throw quilt. A friend of mine has just gotten their kitchen re-done and added a sunroom. So of course she needed a throw that used colors and print themes tying the kitchen and the sunroom together. 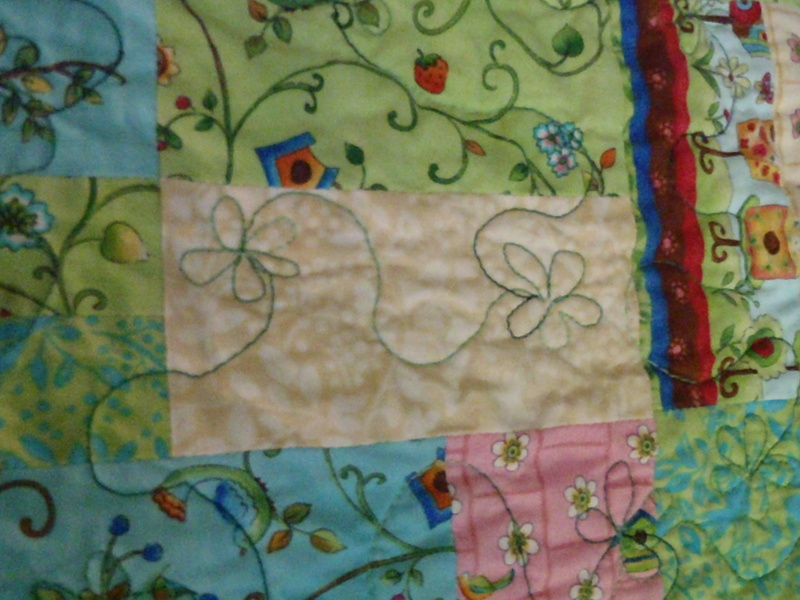 I”m using a variation on the Crazy 8 quilt pattern I’ve done before. Having to match a theme and color was a challenge. She emailed me a picture of her fabric and a pillow covered in hot pink flowers – so cute! It took me longer than I thought it would to find fabrics that would coordinate and not clash and the pattern theme is more of a garden/whimsical birds/Springtime look. I really fell in love with the fabric. It was just such a joyful color palate. And I really think the hot pink stripe in the border gives it a “pop.” I mailed it out yesterday and so she should receive it no later than Friday if the USPS stays true to their word. And a little note about the USPS. I love my postal workers. I’m in there about once a week mailing packages and they are friendly and courteous and they will push my packages into the earlier mailing if the bins of mail going to the airport are still there – even if I get there after 11am, which is usually the cutoff time. They will also price different shipping options for me and tell me if the extra money for Priority Mail is worth it or if my package will get there in 3 days anyway just going Parcel Post. So, please be kind to my postal workers. They are doing a great job! Next up? Two more shopping bags (one is bought, the other isn’t yet), a diaper bag commission that I’m truly excited about doing, and a Bargello quilt technique. 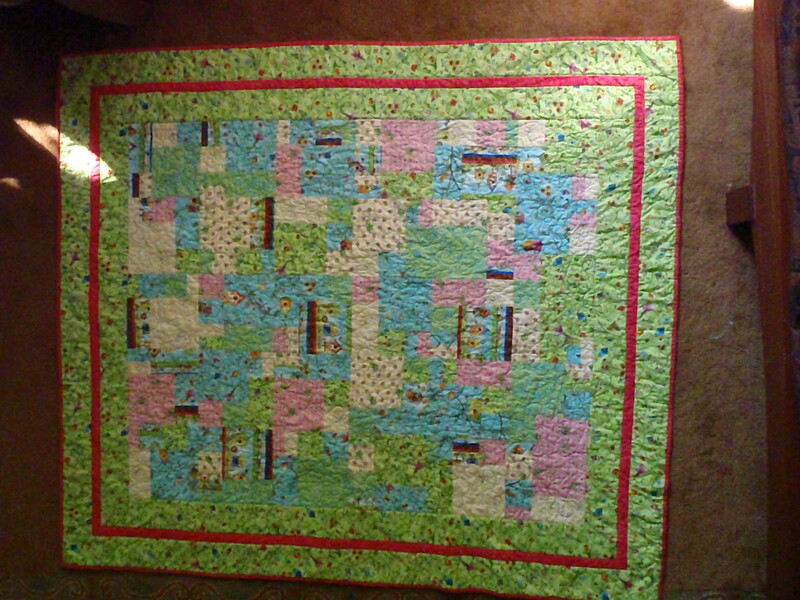 This one is really, really awesome and plays with some trick of the eye to get movement and texture in a quilt.